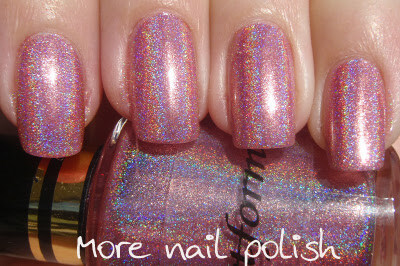 Are you sick of seeing holos yet?? Nah, I didn't think so. This pink Artform holographic is one that you could win in my giveaway. Again, great holo effect with a scatt-inear (my new word for for scattered and linear all at once) finish, like those in the OPI Designer Series. Like the others in the range, this applied smooth and dried to a gloss, so no need to add a top coat if you don't want. Although I found that top coat didn't dull the effect at all. This was two coats in full sun. Where do you get Artform from? Is it only available in the US? I'm in the UK.